Can a printer be too cheap? This is an astonishingly cheap all-in-one printer which performs relatively well for the money you're spending. The past few months have seen the emergence of the first all-in-one printer that costs under £20 (around $26, AU$34) delivered. That's quite a feat given how expensive couriering and mailing are. The Canon Pixma MG2450, which is already more than 24 months old, usually costs around £25 but a voucher from popular online retailer Ebuyer regularly brings the price down to £19.99 including delivery. 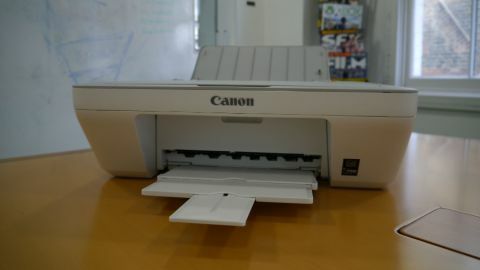 (Note that this review unit of the Canon Pixma MG2450 was provided by Ebuyer). For that price you get a working, brand new printer, complete with cartridges but no USB cable; in an era of cost-cutting, that's only to be expected. Other obvious missing features include the lack of a network port, no Wi-Fi, no borderless/duplex printing, no card readers and no display, and this device uses two cartridges rather than one. When we removed this printer from the box, what surprised us is how light and small the MG2450 is compared to others we've reviewed recently. There seems to be an unspoken law in printing – a direct correlation between size or weight and the price of your device. At 3.5kg, this Canon effort is lighter than some laptops we've reviewed and its footprint, barely larger than an A3 sheet, makes it ideal for a cramped desk in a small office/home office environment. The printer itself is entirely made of plastic with a two-tone grey colour scheme. Controls are kept to a strict minimum: four big buttons offer the ability to copy in colour/black, scan, and there's the obligatory power button. A few status lights complement the control buttons. Another untold rule in the printing industry is that CAPEX is inversely proportional to OPEX. In other words, the cheaper the printer, the more likely the consumables or cost of printing will be high. A cartridge multi-pack (Canon PG-545 and CL-546) might cost under £17 (around $22, AU$29) but each of them will print only 180 pages. Swap it for the more expensive but bigger PG-545XL and CL-546XL combo for £25.95 (around $34, AU$45) to get around 400 pages and 300 pages. To put that in perspective, a full set of XL cartridges is actually more expensive than the printer itself. Also bear in mind that using too much of one particular colour means that you will end up having to replace an entire colour cartridge in order to get the full set again. Accessing the cartridges to swap them is also a rather convoluted exercise. You will have trouble inserting the two cartridges if you have fat fingers. The MG2450 comes with a CD containing the manual in PDF format plus a number of utilities which vary in terms of their usefulness (Quick Menu, My Printer, Easy-WebPrint EX, My Image Garden and Easy-PhotoPrint Ex). As expected you don't need to install any of them in order to get your printer to work properly. The latest printer driver and software package can also be downloaded straight from Canon's support page; the latest one dates from January 2016. There are no paper cassettes, just paper trays – the one at the rear can handle up to 60 sheets up to A4 in size. It can also accommodate photo paper and envelopes as well; both trays fold nicely when not in use (just a word of caution that these can best be described as being a tad flimsy, so bear that in mind). Sadly, we couldn't test the print quality or speed (or the copy feature). The MG2450 was automatically recognised by our computer but a "user intervention" message popped up without any details regarding what intervention was required. Troubleshooting it, though, brought up a worrying error: the printer is not compatible with USB 3.0 ports – "USB Composite Device is an older USB device and might not work with USB 3.0". Since we didn't have any available USB 2.0 ports to hand or another USB printer cable, we contacted Canon for further details and will update this hands-on as soon as we've got more information. Curiously, the scanner did work. It uses CIS technology which helps reduce costs and power consumption by reducing the size and number of components. With a 600 x 1200 dpi resolution (optical), it scans an A4 sheet in around 15 seconds. The printer also automatically wakes up from standby mode and conveniently switches off when not in use after as little as 15 minutes. Canon also claims that it uses a mere 1W in standby mode, jumping to 9W when using its copy feature. The driver settings were pretty good as well with options for cleaning (and deep cleaning), bottom plate cleaning (to prevent paper smudges during printing), roller cleaning (for smoother paper feeding) and a quiet mode which may reduce the printing speed. Clearly, this is an entry-level all-in-one printer and one that performed relatively well for the outlay. It would be a great sidekick for a cheap monochrome laser printer, adding the occasional dash of colour to documents as well as the one-off ability to copy and scan. It is a true plug-and-play peripheral and we had no problem getting it to work without installing the bundled software (who has an optical drive in this day and age?). No problem, that is, except getting it to print – which is a real shame. An interesting point to note: the cheapest standalone flatbed scanner on the market (the Canon CanoScan Lide 120) costs more than twice the price of the MG2450. So the latter would also effectively double as a scanner with copying and printing features thrown in for free.